Wales' current side can be considered a "golden generation" if they qualify for Euro 2016, says manager Chris Coleman. 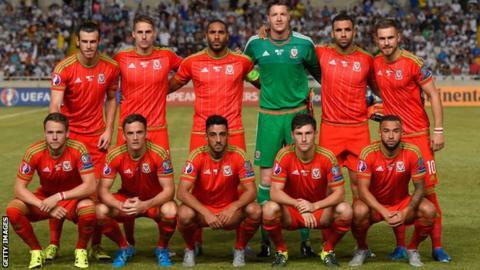 Victory against Israel on Sunday would seal Wales' qualification, following their dramatic 1-0 win in Cyprus. Wales have failed to deliver on their promise in the past, but Coleman is certain they can end the 57-year wait for a major tournament. "I said all along in the first camp in Andorra, I thought this group are something special," Coleman said. "We'll be the golden generation when I'm sitting here with a smile on my face and we're celebrating because we've got enough points, which means we can't be caught and we're on our way to France." Wales have not reached the finals of a major tournament since the 1958 World Cup, the following years punctuated by false dawns such as the narrow failures to qualify for the 1994 World Cup and Euro 2004. But with a squad which includes Real Madrid forward Gareth Bale, Arsenal midfielder Aaron Ramsey and Swansea City captain Ashley Williams, Wales entered their Euro 2016 qualifying campaign with renewed optimism. The emergence of high-profile players prompted some to dub the current crop the golden generation of Welsh football. Coleman was initially wary of the term, but is more open to the idea now his side stand on the brink of history. Three points clear at the top of Group B, Wales could qualify for Euro 2016 with two matches to spare if they beat Israel at Cardiff City Stadium on Sunday. "With that comes a bit of pressure. There's a lot of quality there. We have to handle that," said Coleman. "But I do believe it's on the way. Everybody will talk about the Belgium game [a 1-0 win in Cardiff in June] - it was fantastic. This result out there [Cyprus], for me, is equally as important. "Three games left, I still think the biggest one has yet to arrive. Hopefully it will be sooner rather than later." Discussion of a golden generation tends to revolve around Bale, which is understandable given the 26-year-old's prodigious capacity to win games almost single-handedly. While the world's most expensive player has scored six of Wales' nine goals in this qualifying campaign, the defensive resolve of Coleman's side has also been pivotal to their success. Wales have conceded only twice in their seven Euro 2016 qualifiers to date, keeping clean sheets in their last four games. Coleman believes Williams, the team's captain and formidable centre-back, has been integral to Wales' rise. "[He's an] absolute rock. He makes me feel calm. When the ball's flying around the box I just know he's going to get on the end of it," added Coleman. "He's a great leader and I think the spine of the team is extremely strong. Any successful team needs that. "At one end of the pitch you've got one of the best defenders in the Premier League [Williams] and, at the other end of the pitch, you've got one of the best offensive players in the world [Bale]. "You've always got half a chance if you've got that in your team."